One of my favorite YouTubers (BronzeGoddess01) recently posted the above quote on her instagram page. 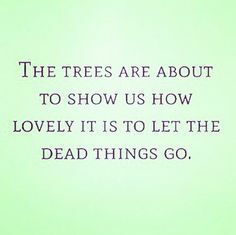 While reflecting on the topic, I was reminded that fall is God’s way of letting us know that in order to thrive we must let go of the dead areas of our lives. A dead area could be a relationship, a job, or physical objects. It could also pertain to a negative thought or experience you are holding on to. Every now and then, it is important to evaluate our lives and remove the things that aren’t serving us in a positive way. This is easier said than done however it is essential to your growth. Letting go does not mean you’ve given up. It just means that you are choosing your happiness.